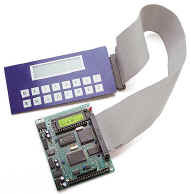 The Kpad is a low cost user interface ideal for simple operator display applications. Measuring 5.2 x 2.5″, the Kpad supports a 16×2 line character-type LCD, 16 keys, and a blue plastic overlay. User definable 8×2 key layout paper can be customized and inserted underneath the blue plastic overlay. 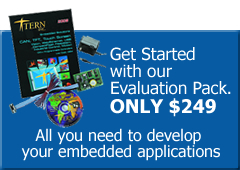 Software sample programs are available demonstrating how the unit is programmed in C/C++. The Kpad is available in two variants, making it available to a wider array of TERN controllers. The Kpad-IO version is driven by 15 programmable TTL I/O pins (and also + 5V and GND signals). 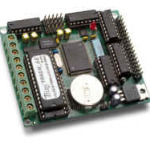 This makes it compatible with essentially any TERN controller with simple wiring between the unit and the controller. The Kpad-Bus version makes any custom wiring unnecessary. For TERN controllers with an accessible 20×2 J1 header (check with us if you’re not sure), the Kpad-Bus can be connected directly via the attached socket. A simple flat-ribbon cable can also be used to connect the unit. Smaller boards like the A-Core can even be directly soldered onto the back of the Kpad-Bus. Easy bus-interface integrates with most TERN controllers. Interfaces requires wiring to 15 TTL I/O lines (6 if just using LCD, 10 if just using keypad) 5V and GND. 20×2 J1 socket. Connects directly to host TERN controllers with compatible 20×2 J1 bus headers.